Some may have heard about what transpired in the Saudi Arabia’s consulate in Istanbul a couple of weeks ago, when Saudi journalist Jamal Khashoggi never came out of the diplomatic building which he entered a couple of hours before. 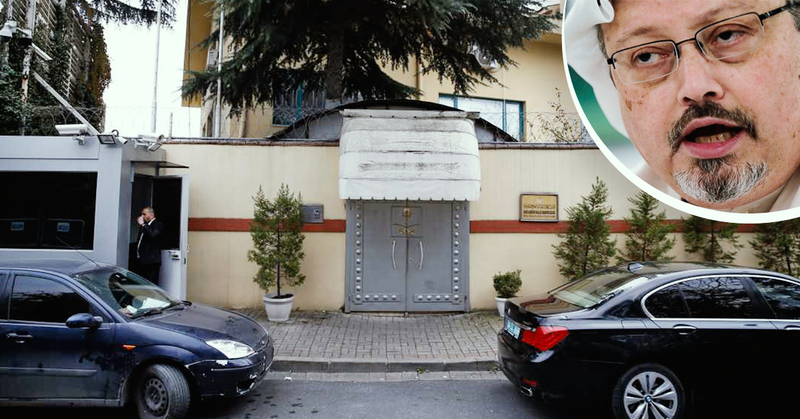 After a couple of days of uncertainty, Turkish authorities and media launched a massive bombshell regarding the case – the Saudi journalist was allegedly killed inside the consulate by a team composed of Saudi intelligence officers. All in the meanwhile, the Saudi officials have countered the claim, insisting that Jamal Khashoggi left the building unscathed. But what really happened? Jamal Khashoggi was a Saudi Arabian journalist, author and a former general manager and editor-in-chief of Al-Arab News Channel. On a self-imposed exile, Khashoggi left Saudi Arabia in September 2017, after he fell in disgrace with the government, especially in the eyes of the Saudi crown prince, Mohammad bin Salman. Khashoggi was sharply critical of the crown prince and he also opposed the Saudi Arabian-led intervention in Yemen, whilst also promoting a progressive agenda in one of the most conservative monarchies on the planet. After taking residence in the US, Jamal started writing for various Western publications, including the Washington Post, with most of his writings focused on the lack of freedom of expression in the Arabian world, as well as further criticising the Saudi Arabian Kingdom. On the 2nd of October, Jamal Khashoggi entered the Saudi Arabian consulate in Istanbul in order to obtain documents related to his marriage. He never left the building and his wife, who was waiting for him outside of the consulate, declared him as missing to the Turkish authorities. What follows next is not only brutal, but also surreal – anonymous Turkish police sources have alleged that Jamal was murdered and dismembered inside the consulate by a team composed out of 15 Saudi officials who entered Turkey the same day. In the meanwhile, The Saudi Arabian government has declared again and again that Khashoggi left the consulate alive through a rear entrance, but all of their claims were refuted by the Turkish authorities, who have said that there is no CCTV recordings of him ever exiting the building. After a couple of days of diplomatic in-fights between the Turkish and the Saudis, the Turkish authorities were finally allowed to enter and inspect the consulate as per a joint Turkish-Saudi investigation. What they found points to the direction that evidence was “tampered with” during the investigation, as well as evidence that supports the idea that Khashoggi was killed within the consulate. After a couple of weeks of completely refuting the idea that the journalist was killed in the consulate, the Saudi Arabian authorities finally admitted that Jamal Khashoggi was indeed murdered by a team composed out of intelligence officers. However, the official declaration claims that Jamal was “strangled” after a brief altercation with some members of the team. This explanation comes after the Turkish officials have been leaking a steady drip feed of details from the on-going investigation to various Turkish journalists. Supposedly, a key audio recording of the murder exists as well and various photos have begun circulating on the web which allegedly show Jamal’s dismembered body. Nevertheless, one thing is for certain: Khashoggi was killed in the consulate and his clothes were given to a Saudi Arabian official, Mustafa al-Madani, who then tried to pose as Khashoggi across various places in Istanbul, in an effort to put the Turkish authorities on a false lead. As said before, after weeks of denying involvement in Khashoggi’s disappearance, Saudi Arabia has issued an official statement regarding the death of the journalist. On Sunday, Adel al-Jubeir, Saudi Arabia’s foreign minister, has told reporters that Khashoggi’s death was indeed a “murder” and that it was also a “tremendous mistake”. “We are determined to uncover every stone. We are determined to find out all the facts. And we are determined to punish those who are responsible for this murder”, Adel al-Jubeir said in an interview with Fox News. In Saudi Arabia, the investigation regarding the murder has been placed directly under the supervision of the King. Moreover, statements have been issued that pretty much paint the picture that the murder of Khashoggi was done “outside the scope of the authority” of the King and that the perpetrators would be prosecuted as soon as the investigation is over. “The individuals who did this did this outside the scope of their authority. There obviously was a tremendous mistake made, and what compounded the mistake was the attempt to try to cover up. That is unacceptable in any government”, Adel al-Jubeir added. Some may ask themselves why this crime occurred in the first place – the answer might surprise a lot of people. What most publications seemed to omit when talking about Khashoggi is the fact that he was a prominent Muslim Brotherhood member and contributor, and that the Muslim Brotherhood has been designated as a terrorist organization by Saudi Arabia, even though the country funded the movement for years at a row. Given that the crown prince, Mohammed bin Salman, is currently in a process of power consolidation in his Kingdom, the disappearance of Jamal Khashoggi might be tied with the fact that a lot of prominent Saudi citizens were imprisoned in Saudi Arabia lately. Or, as the Saudi officials have said, maybe the murder was simply conducted by officials without the permission of the Royal family – which might mean that the power struggle within the Kingdom is still on-going, even after the arrests that have been made in the last year. Jamal Khashoggi was a thorn in the side for the Crown Prince and the Saudi Royal family. He was an insider that knew how the Kingdom worked and most importantly, he was a critic to pretty much everything bad that happened in the country. And given the lengths that the Saudi Royal family has undertaken in order to paint the Crown Prince as a “reformer”, one must think that Jamal Khashoggi was the worst kind of enemy for Mohammad bin Salman. However, there’s still the case on why would the Saudis risk so much for just one man. After all, why throw everything under the bus when you want to change the perception of the world regarding your country? “Saudi policy toward a critic like this is always to buy people off, try to bring them back into the fold. An act like this is totally out of character for the royal family. If it happened, it would be because it was a total [mistake] by some people, and there will be consequences”, one source told the Washington Times. The repercussions will be massive for Saudi Arabia. World leaders are calling into question a lot of stuff that has been buried under the rug regarding the Arab country, investors are withdrawing their projects from that area and the image that was projected regarding the Crown Prince as being progressive and liberal has been completely shattered by what has transpired. It will be interesting to see what the response of the United States will look like, given the massive economic ties that exist between these two countries. Nevertheless, the disappearance of Khashoggi might have proven to the world the harsh realities of Saudi Arabia, a thing that everybody seemed to ignore in the last couple of years. Saudi Arabia has finally made the international headlines with this case – but not in a good way. We’ll have to wait and see if something really happens now, or if the world leaders will simply turn a blank page and restart the diplomatic relations with Saudi Arabia like nothing ever happened.